“The Long Road to Heaven”, the annual pilgrimage to the Galician city of Santiago de Compostela has taken place for over a thousand years. In the great cathedral of Santiago are said to lie the bones of St. James of the Great, cousin to Christ, an original disciple and later “resurrected” as the legendary slayer of the Moors. From the Middle Ages onwards, this most evocative of Christian shrines has attracted pilgrims to the Spanish city from all over Europe and further afield. 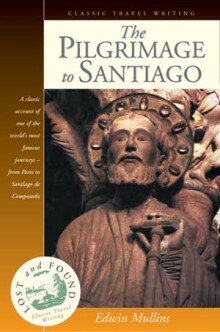 A network of routes, lined with statues and other symbols, leads to Santiago, but the most celebrated is that from Paris, across the Pyrenees and through the arid uplands of northern Spain.Following in their footsteps, Edwin Mullins takes the pilgrim route, fascinated by its extraordinary historical and religious symbolism. Journeying by car and by foot, he retraces the path from the Rue St. Jacques in Paris to the Baroque magnificence of Santiago’s cathedral. On his way, he recounts the legends of Charlemagne, Roland and St. James himself, exploring the ideological dimension of the spiritual pilgrimage and the proliferation of religious orders around the route. He also looks at the pilgrims themselves, their motives and experiences, the millions of people “who walked the same journey out of love, out of punishment, duty, fear, or out of simple blind faith”. First published in 1974 and now reissued with a new Preface, this classic account of one of Europe’s most stirring journeys provides an amalgam of history and geography, religion and archaeology, fact and legend. Illustrated with specially taken photographs, The Pilgrimage to Santiago is both a narrative account of the pilgrims’ route and an analysis of a remarkably enduring religious phenomenon.